My wife and I live in Lincolnshire, UK. In the following tale please don't expect any ghostly figures, or people walking through walls, etc. Nevertheless, I would like to relate the following, as yet, unexplained mystery. Back in 1996 my eldest daughter, who at the time was living in a small village called Writtle in Essex, decided to get married. Her flat was rather small so local accommodation had to be found for my wife and I for a couple of nights. 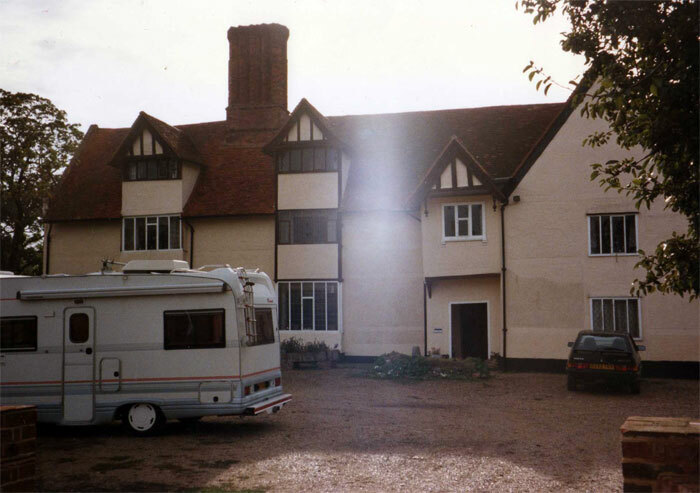 It turned out to be a rather ancient farmhouse Bed and Breakfast not far from Writtle. On arrival the lady owner led the way upstairs to our room on the top floor. I happened to suggest, while climbing the creaking staircase, what an excellent place for ghostly happenings. On reflection, perhaps I should not have joked. That night we slept quite well until, that is, just before daybreak at which point my wife awoke, asking me why had I switched on the light as she had been disturbed by a "brilliantly bright light shining in her face." Needless to say, I had not switched on any light and had not been aware of any light. During conversation at the breakfast table a little later she mentioned this incident to the owner who immediately told us, and the other guests at the table, that this was nothing new as sometime previously she had had a traveller staying - in the same room - who had experienced exactly the same thing. We more or less dismissed the whole thing although it was rather intriguing that someone else had earlier given credence to our story. It was what happened the second night that really disturbed us. While we were sleeping, my wife apparently had gradually become conscious of a sound, almost like a waterfall, seemingly emanating from one corner of the room, the corner nearest me. So much so that she woke me saying "That water, you must be getting soaked!" Interestingly, I realised then that I also had become subconsciously aware of gushing water. I can remember thinking vaguely, "Where is all that water coming from?" knowing that there was no tap or any source of water in the room. The following morning at breakfast we somewhat hesitantly mentioned our experience, but immediately a gentleman across the table from us admitted that he also had heard the sound of rushing water, so much so, that he felt obliged to get up and open a window, half expecting to see torrential rain but there was nothing. Everything was dry. His room, incidentally, was immediately below ours. We checked with the owner of the property but she confirmed that there were no water pipes in the roof in that area of the house, nothing that could have caused what the three of us had heard. Later that morning just before we drove off, I turned to take a photo of the farmhouse as I like to keep a record of any interesting place we stay at. When the photos were returned from the developer - at that time we did not possess a digital camera - we were surprised to see what looked like a mist in front of the upper part of the house, very near the window of the room we had slept in. Now, I am well aware of how easy it is for light reflections to creep into a camera, but it is a fact that this camera had never played up before. I was tempted to accompany this story with the photo but decided not to bother as it probably was just a "trick of the light." But there again - who knows? The following comments are submitted by users of this site and are not official positions by yourghoststories.com. Please read our guidelines and the previous posts before posting. The author, enyapcire, has the following expectation about your feedback: I will read the comments and participate in the discussion. sonri your comment made me laugh. I can't say people have said weird things when I've tried to wake them up but my dad has spoken in his sleep several times and I have been told by my mum that I laugh in mine. My dad once yelled at my mum because his dream was so realistic. Anyway this story is pretty strange. I would like to see the photo. It could be a trick of the light but I am still curious about it. Thanks for that,lsandhu. I didn't think of it like that but I agree with you. geetha50, given that the other guest's room was immediately below the poster's, I kind of consider that to be one area. If there were real rushing water, say down one side of the house, it could well be heard in two rooms at the same side, and the same could be true of noise created by residual energy. Who knows, maybe a former owner really enjoyed power washing the place on a weekly basis and that's the source of the residual noise. I going to jump on the band wagon here and kindly ask that you attach the picture. It would be great to see it for ourselves. I would tend to agree with you on the residual haunting theory but something got me thing. The original poster mentioned that a gentleman that was staying right below their room heard the same thing. If it's residual haunting wouldn't it stick to one area and not more than one? If anyone else can answer that, I would like to know also. Thank you for this fascinating account. The water could well be some kind of residual energy, although I'm not sure about the light. Photos are always dodgy and can open the poster up to unpleasant accusations, so I don't blame you for not posting it. Whoever said a picture is worth a thousand words clearly was not a paranormal investigator. However, if you do decide to post it, I promise to use my best efforts at scrutinizing it (although I am no expert) and to give you my honest opinion. I like this story however I wonder why you did not attach the picture? We could decide for ourselves what we think about the picture. But regardless, I think this is a very interesting house and I bet there are many other stories from other guests in the place. Please, please, please post the picture. I want to ask this as, was this mist on the negative as well? You are quite right, it may have been lens flare, or even a bit of condensation in/on the lens, but without seeing the picture everyone is left guessing as what this mist looks like and just what may have caused it. By sharing t with the members here, you just might find someone who can explain what happened, or it will help confirm that you 'captured' something paranormal on film. Interesting story. You should have included the the picture anyway, even if it was a trick of light it would have added to the ambiance of your story. Imagining someone waking me like that made me laugh. Once while attempting to wake my sister, she suddenly sat up perplexed and asked which of the walls were talking, I can still laugh at that. Without an answer she flopped back to her pillow and fell back to sleep, apparently thinking the walls could carry on quite well without her. © The ghost story Running Water Mystery is copyrighted to enyapcire. Edited by yourghoststories.com.